Rabinoff Consulting Services, Inc. provides risk management services to the Sport, Physical Education, and Fitness/Recreation industry. 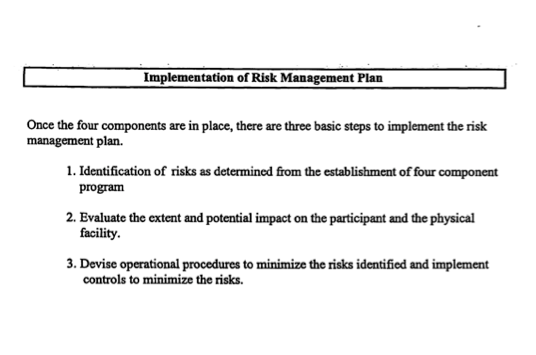 Risk management is the systematic analysis of facilities and programs to identify potential risks and develop management systems to reduce or eliminate those risks. 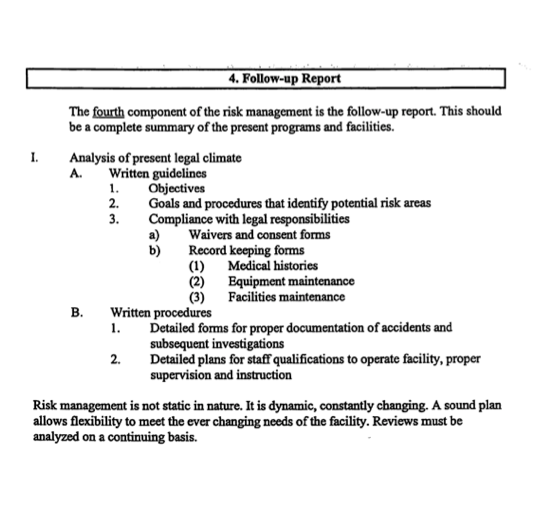 Risk management also minimizes injuries, accidents and potential litigation. Health clubs, municipalities, fitness and wellness centers, recreation centers, colleges, and universities are vulnerable in today’s litigious society. Noted sport and fitness risk management expert Dr. Marc A. Rabinoff, Professor Emeritus, Human Performance and Sport at Metropolitan State University of Denver founded the company in 1986. Dr. Marc A. Rabinoff’s extensive database of sport facility risk management standards of care covers more than 40 years of litigation history. In addition, the database includes equipment design, warnings, and usage information. Dr. Rabinoff is a Diplomat, Board Certified Forensic Examiner with the American Board of Forensic Examiners. He has served as a forensic expert witness, working for both the plaintiff and the defense, in more than 400 cases since 1980. Dr. Rabinoff’s book published in 1996, The Forensic Expert’s Guide to Litigation: The Anatomy of a Lawsuit, written with personal injury expert Stephen Holmes, Esq., outlines the litigation process, the forensic expert’s role in the process, and how practicing professionals in all fields can better understand the liabilities inherent in their industries. His latest publication “The Dark Side of Sport”, published by Bigger Faster Stronger Magazine in 2009 is a similar book to his other book, but geared more towards parents, coaches, and Sport Administrators as they learn about their liability in sport related injures litigations. What can Rabinoff Consulting do for you? Simple stated, most injury-related litigation doesn’t have to happen. Dangerous situations can be eliminated thorough qualified inspections, a thorough analysis of possible risk areas, training seminars on waivers and warnings, and professional risk management planning and implementation. Rabinoff Consulting helps reduce or eliminate unnecessary dangers and their potential legal liabilities. Health clubs, recreation centers, universities, insurance companies, gymnastic schools, trampoline courts, and fitness equipment manufacturers can all benefit from professional risk management services. Prevention is the best Defense! 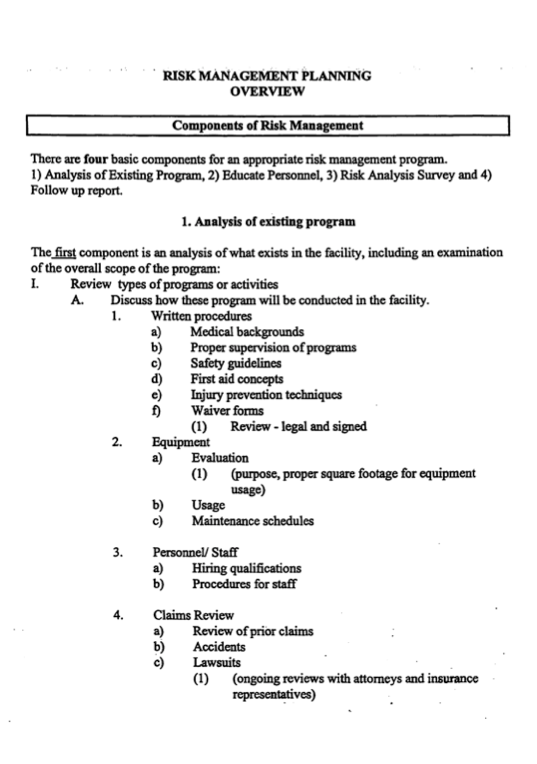 Rabinoff Consulting has been a leader in risk management education for more than 40 years. A key role of the company is to assist health and fitness, physical education & recreation facilities – from local health clubs to major university fitness centers – in selecting the latest technologies and methods to meet ever increasing standards or care and safety. ·24-hour nationwide availability for staff, customer and client training including video presentations of actual health and sport/fitness personal injury cases. Training seminars range from one-hour to multi-day symposiums. Our most popular class is the one-day seminar. This two-part seminar includes staff education on liability issues followed by a comprehensive safety audit. 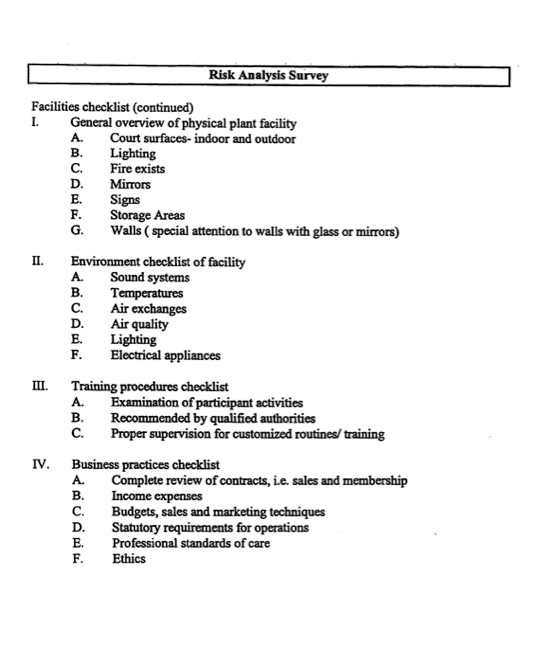 The 26-page audit covers the entire facility from the weight rooms, saunas, pools, to daycare, playing fields and pro shops. 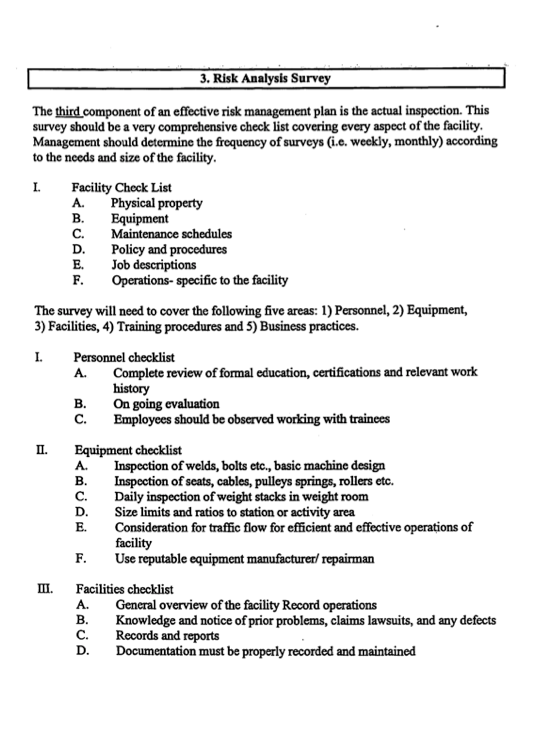 The audit is custom designed to meet the special needs of your facility. 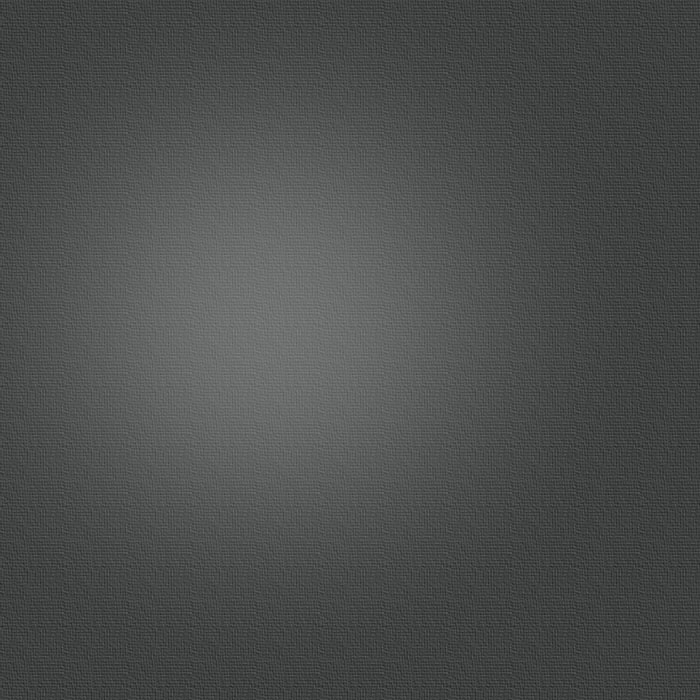 In addition, Rabinoff Consulting provides curriculum development, ideas, and concepts to academic institutions where students can obtain formal continuing education programs and academic classes in the disciplines of Physical Education/Fitness/Recreation, Sport Management and Risk Management for facilities operations.